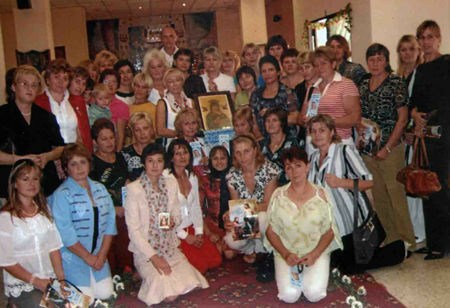 The Universal Living Rosary Association of Saint Philomena, Past Missionary News From Around the World, January 2009. 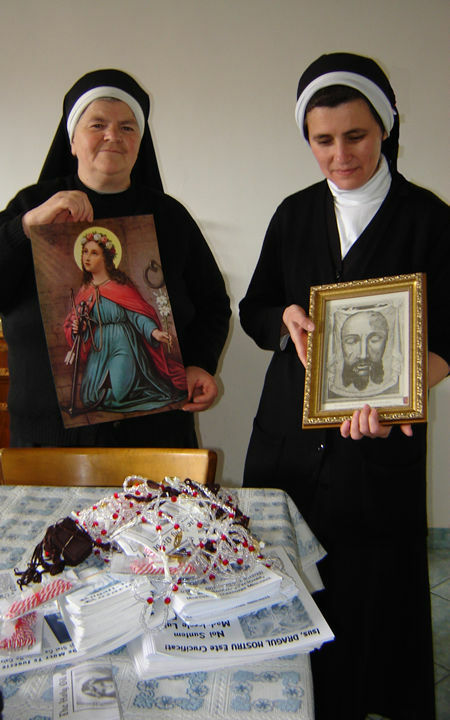 J. M. + J. F.
Today I received your shipment, God will pay your Charity, for sharing so, such as rosaries, medals, pamphlets and books that we used to know and love God more, His Blessed Mother and the Glorious St. Philomena, not forgetting Blessed Pauline, thanks to her that we are united! Next week I will send the lists that have already completed. Thank to Mother Emerentia! (I think it helped with the box). We remain united in prayer and the Sacred Hearts of Jesus and Mary and Joseph. Need someone to pray the Rosary with? Just added to our site is an audio production of each mystery, provided by Wayside Audio. At the bottom of our How to Pray the Rosary page, you can now listen to the audio presentation as a companion to your reciting the Rosary. I will be in Khartoum for a while pending my travel to Juba, Southern Sudan. Meanwhile, Patti, you will not believe it. 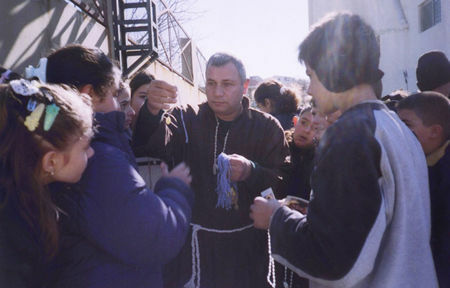 In the heart of the main city, people are using their fingers to recite the Holy Rosary. The very few Rosaries and Miraculous Medals I brought with me are all gone. It is a very unique situation. Jesus help us. I am Afraid, in some parts of the world; there is an urgent need for prayers of intercession. Mary is still not taken at heart here. May be in the other parts where I am yet to visit. Peace and all that is good be with you! Thank you very much for the large package of sacramentals, rosaries and the Miraculous Medals, etc. Many Catholics form Jorand and Gaza will receive them. I will try to organize the ULR in Amman among the Filipino migrant workers. In Jesus Victim, Dear Mother Patty. I send you, some pictures of my paintings about Our Sister Santa Philomena, in his tribute. I hope you like. send my blessings. I received more than I asked for. I also received a note saying that the center in Lebanon is in Ghadir, but unfortunately it is a P.O. Box address so I will write to them and ask them for their address or phone number or something. I will take a chance and send it registered mail to you, a bit a time, and hopefully you will let me know if received. I am sure you should get it, or do you want me to send it to the Lebanon office. As you wish. I am very happy to send another list of new members of the Universal Living Rosary Association of Saint Philomena (ULRA) who willingly accepted the devotion in honor of the Blessed Virgin Mary and St. Philomena. The list is composed of Catholics in our locality coming from different walks of life. Some are professionals, farmers, youth, children, sick people, poorest of the poor, fishers and other ordinary Filipinos who have strong faith in the LORD. Sometimes I could say that while it is true that Filipinos are very poor economically but very rich spiritually, it is the most well known identity of Filipino people. We are very much happy together with my family after we received the big forex box containing very beautiful rosaries and other sacramentals last January 22, 2009. 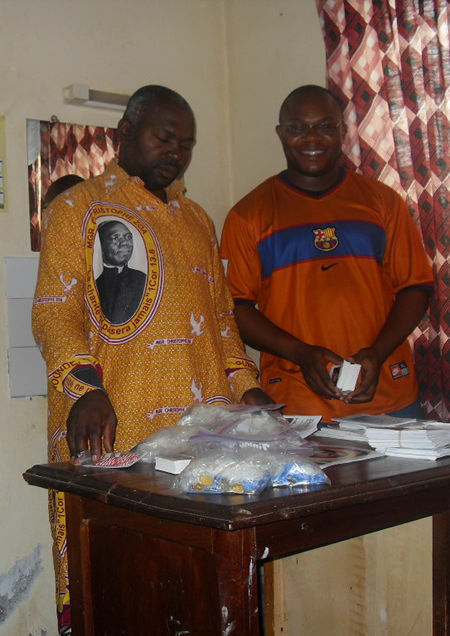 In fact, since then we were very excited distributing them to our brethren here in our locality. We became so inspired after we observed that the faithful were very eager to accept the devotion and the sacramental we were given to them. Thank you so much to the Universal Living Rosary Association and we thank God for sending us these weapons to be used in fighting against the evils in the society today, particularly in our country that majority are suffering different kinds of crisis, such as; economic/financial, moral and even some had suffered spiritual crisis. I strongly believed that the devotion is a way to open back the gates of heaven for us to be saved from this entire phenomenon and would bring us back to the mercy of God, and we are sure that many are now praying everyday the Holy Rosary. In fact, the supplies that we received are almost consumed already, only few had been left. However, we ask you Director Patti to help us pray because as we are propagating/distributing the devotion and after I aired it in our Evangelization Program on air, last December 28, 2008-January 03, 2009 our youngest 7 month old BB Boy Jerome Joy was confined in the hospital as he was infected with a dengue fever. We were sad during that time as we spent our new year in the hospital. But, we are very much thankful to God almighty because despite of what had happened to us, we were not discouraged, instead, our zeal to propagate the devotion and to serve the Lord has been strengthened. Especially that when we offered a healing prayer for God thru Mama Mary and St. Philomena him, he was gradually healed from his sickness. The Holy oil and the Cord were very useful in his healing. besides, we were also able to share the devotion in the hospital, particularly to our room mates whose BB girl (6 months old) was also sick, suffering leukemia and because of our prayer to St Philomena, the family was able to secure free blood donors as they find it hard to look for a blood type and since they had no money to pay. By the grace of God thru St. Philomena, God sent us instrument who gave them bloods. Just Last Sunday, January 25, 2009 while we were facilitating the on-going formation seminar of the Basic Ecclesial Communities in the Cathedral Parish and while my wife was busy distributing the devotion to hundreds of participants, we were struck by an information that again our child Jerome Joy, the same BB boy had again suffered difficulties in breathing due to severe cough and colds. So, we brought him back in the hospital and until now he is still confined in the hospital. The situation adds our burdens as we are now on financial difficulty. Please pray for us as we are also fighting other forms of enemies attack. I believed that through prayers, especially that when many are praying everything can be achieved and God provides. Lastly, please accept another lists of new members of the ULRA which I will send in a separate page, please reply as proof that you have received the mail. Finally, Please send other boxes of the devotion to include the Rosary Numbers, books if any and other sacramentals as we are now running out of supply and there are a lot asking of the devotion. Thank you so much for your effort and sacrifices of propagating this devotion, anyway, your rewards of eternal happiness in heaven await ahead of you. I try to send you some new pictures (see below). Every time when the ULRA leaflets arrive at our home we are very happy because we find out about our sisters and brothers round the world. Thank you Patti for your effort. We pray for you. Mrs. Reut Felicia reading the leaflets. She just died few weeks ago. Please pray for her departed soul because she was a stone of our persecuted Church. A new group of Protestant persons willing to learn more about our Catholic Faith. We need more sacramental materials please. Thank you. God bless you! 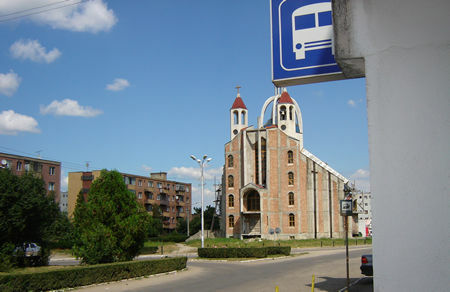 The new Greco Catholic Church at Gherla- Cluj. Fr. 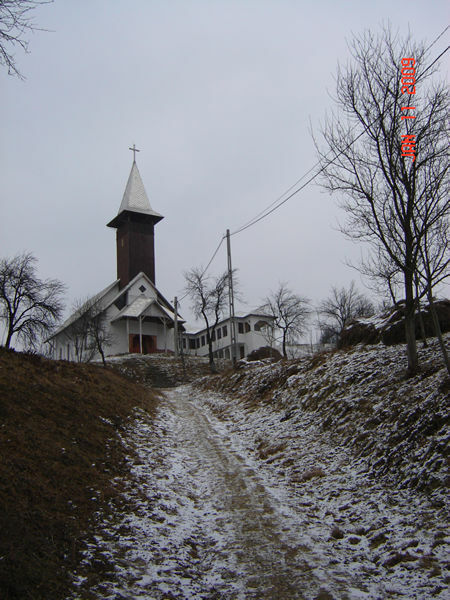 Monoshes, the Parocho of Gherla needs help to enter at list under ground of this church to celebrate the Holy Mass. He needs many things there starting with the Altar, chairs, heating system, table clothes, Altar clothes, candles, candles sticks, calice, crucifix, etc,etc. It is for a new beginning in this town. "Thank you St. Philomena for your encouragement. More rosaries are very well come. Thank you. We pray for you and we invite all ULRA sisters and brothers to visit us for this Easter. 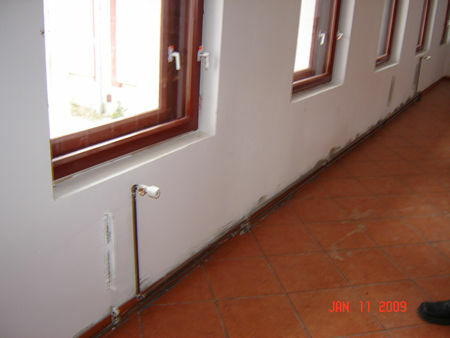 The accommodation will be in our Monasteries." The Balan locality. A lady from this town has a dream last 2-3 years ago. She sow a giant devil ready to eat all this locality .But Our Lady appeared too and told her to build a place where people to go and pray. She was very impressed by this fact and accepted. It was a big effort but Our Lady helped her. The miracle was that the local Authority accepted too. 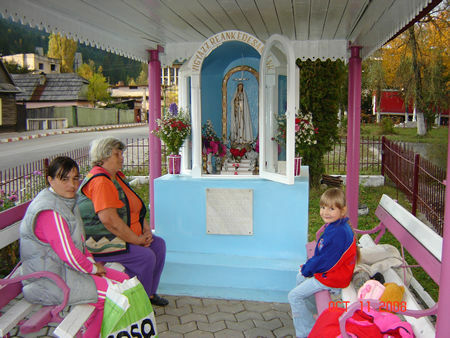 So as you can see people found this place to honor Our Lady exactly near the Valley of Olt River at Balan. Thank You Our Lady for this wonderful present for this miner’s town. 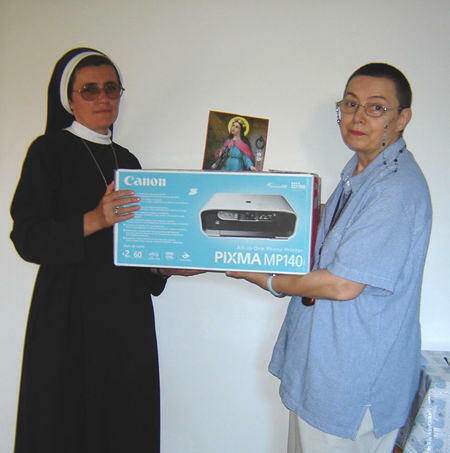 Sr. Marcela receiving a copy machine for their convent, so much necessary in spreading the Faith. "Thank you very much dear ULRA Family. We always pray for you. God bless you all!!!" A poor woman abandoned by her husband asks help at St. Philomena for school things for her children. "We, the simple believers are very much obliged to you for this unexpected spiritual help. Thank you Patti! All this work to be for the greater glory of Our Lord and the victory of Our Queen through the St. Philomena!" 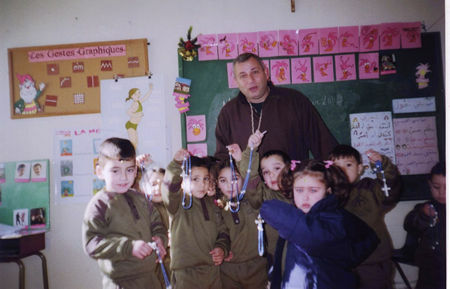 The little Carina have a special message for you: "Dear Patti please send us some more rosaries, Holy Medals, Holy Images, all you can for our Protestant friends .They think they are Protestants but in fact they never pray, never go at Church. And they are happy to pray Rosary with me! I am also a Protestant!" I send you now the photos from another shop, they used the past way in the size of them. I wish you will see them good, I beg you to tell Mr. Richard (responsible of the web site) to put the photos once again in the web, because I saw the photos are very hard to see. I am sorry I sent them at the shop in the village, now I am in the city; they know better and have better technology. I was overjoyed to receive an e-mail from someone who is a member of your Universal Living Rosary Association of Saint Philomena (ULRA) organization. I wish to congratulate you and your husband and staff for the great work that you are doing. The devil and satan himself leave very meekly and powerlessly when I have recited the Holy Rosary. The power of the Holy Rosary is so great that the Evil Spirits leave when I just say the Hail Mary or better just Half of it! MD. Marian Maritime Pvt Ltd. I send you the testimonies and some news from Ukraine. I am ready to send you more information and testimonies if you need them. Thank you very much for your understanding and your support. We are working very hard for the Living Rosary. My name is Hanna Henyk from Vyznitsia. At the present time I am working and living in Rome. 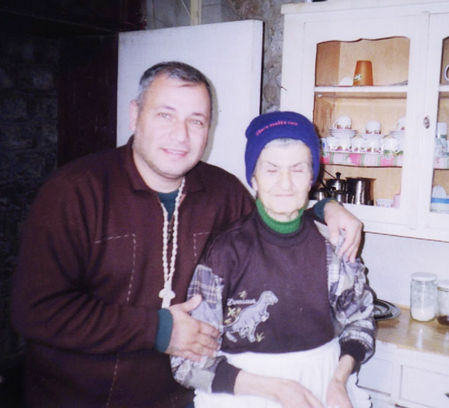 Some years ago I moved to Italy illegally in order to feed my children from Ukraine. In Ukraine it is very difficult economical and political situation. Many people are jobless and don’t have any possibility to make a little money. Therefore I had only one solution to go to Italy and to work there. Last year the Italian government announced about the amnesty of the illegal migrants and I applied for the official permission to work in Italy. 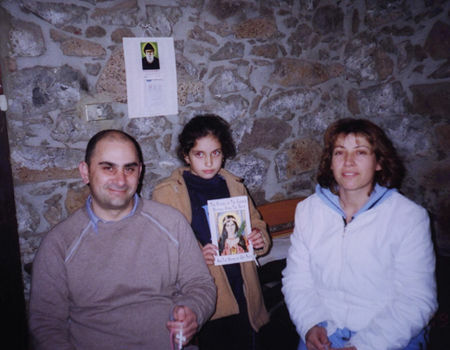 Before I was praying very hard to saint Philomena for the grace to get the official documents for working. It took me half year and now I have all the permissions to work and live in Italy. I visited my children two times within a year in Ukraine. I am very happy that I had a chance to see my husband and children who live in Ukraine and I am grateful to the Universal Living Rosary Association for spiritual care and support of so many Ukrainian migrants in Italy. They wait impatiently for the new newspapers of "Voice of Living Rosary", sacramentals, oil and cords of saint Philomena. I thank you very much this wonderful spiritual care and support. For couple a months I was suffering from the terrible infection of my stomach. At the present time I live in Rome. I become the member of Universal Living Rosary Association of Saint Philomena many years ago and this devotion was my saving stik which helped me to overcome very difficult and complicated times of my life. Five years ago I left Ukraine and moved to Italy in order to provide the material assistance to my children who live in Ukraine. 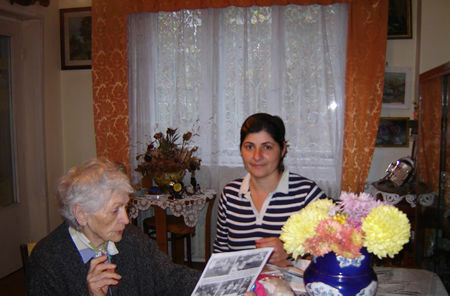 The life of Ukrainian migrants in Italy is very complicated because many Ukrainian migrants are taking care of the oldest Italian people who are handicapped. They receive very low salaries and must stay with their old people all the time day and night, Sometimes the owners don’t let the migrants even get out of the house to go to the hospital or buy a food. They must stay 24 hours with the oldest people whom they must take care. I got sick and didn’t have any possibility to the hospital. The medical care in Italy is very expensive. 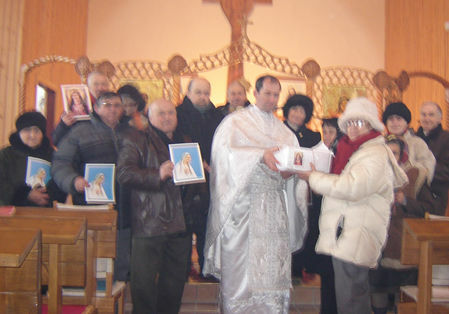 Then I took the oil of saint Philomena and prayer book which I received from Living Rosary Center from Ukraine and prayed the Novena to saint Philomena and the miracle took place. I was suffering with my stomach for two weeks and now I am healed. Also I want to thank you very much for the newspaper "Voice of Living Rosary" which is published in Ukraine. For us migrants this is so vital and important newspaper because this is our daily bread. 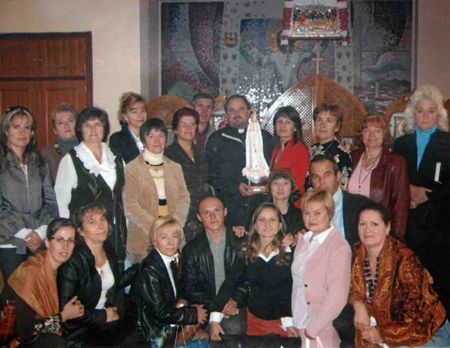 Thank you that you love us very much and helps the Center of Living Rosary to operate in Ukraine and Italy. My small daughter was healed by the oil of saint Philomena. My daughter was suffering from the neck infection and she had very high temperature. The doctor prescribed my daughter to take antibiotics and use a lot of pills. The infection was killed but her health condition was very severe. 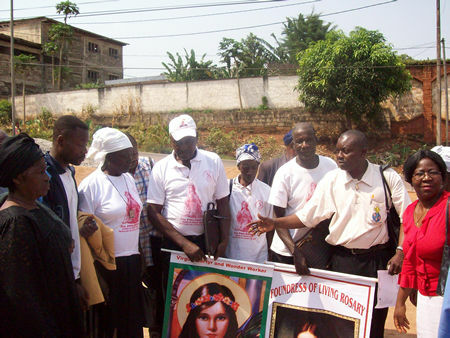 Then I started to pray the Novena to saint Philomena and use the oil of this saint. I am grateful to God and Virgin Mary that my daughter was healed and now she came back to the normal life. I would like to share with you the joy which took place in my life. Recently I became the member of Universal Living Rosary Association of Saint Philomena. I was suffering for the terrible pain in my feet. The pain was very terrible and hard that I was not able to walk and the situation was very difficult. I visited the doctor of my hospital but the remedies were useless. Officially the medicine in Ukraine is free. But if someone get sick she or he go to the hospital and give the doctors money under the table. The patient must buy everything from the pills to the needles and to give the money the doctors. Most of the remedies are imported from Europe and USA which are very expensive. Even basic remedies are taken from Europe. In Ukraine there are not such thing as the medical insurance. Every time when I visited the doctor I spent a lot of money for the remedies and doctor’s service then I good thought came to my mind to use the oil of Saint Philomena which was received from USA via Living Rosary Center in Ukraine. I prayed the Novena to saint Philomena and chaplet and then I oiled my feet with these oil and after finishing this Novena I felt the much better. My health condition is improved rapidly and I strongly believe in the miraculous power of the oil of Saint Philomena. Also I am very content and blessed to join the Living Rosary Center and now I try to invite more people to join the Living Rosary devotion which is has the powerful strength and protection in God. 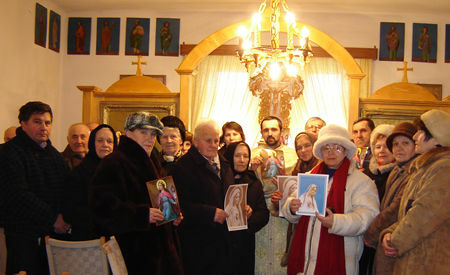 The first month of January became very fruitful for the development of Living Rosary in Ukraine. 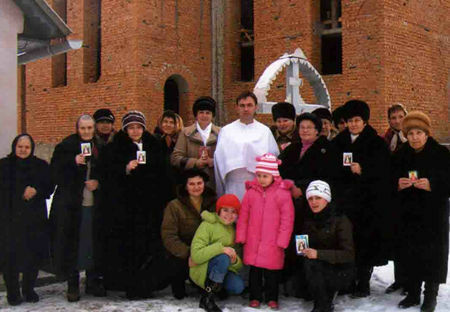 This month the Living Rosary extended the work of Living Rosary at two regions of Ukraine. The center started to operate in Crimia. There are three local leaders who will spread the devotion to Living Rosary. They started to enroll more people because this region is very high populated. 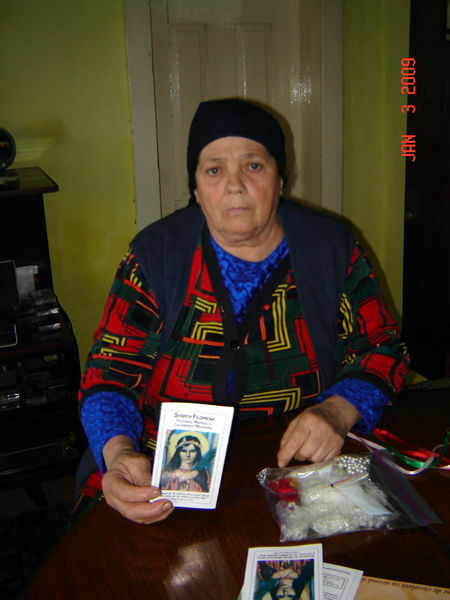 Most of the people who live on this territory speak Russian language and therefore they are willing to receive the material and newspapers of Living Rosary but they have some difficulties with Ukrainian language. The center of Living Rosary hired the translator who is undertaking the translation of the all the materials which we have. On 20 of January the center of Living Rosary Ukraine published 6th edition of the official prayer book of Living Rosary for Ukrainian usage. This time it was published 8 000 prayer books. This edition was updated with some new miracles and we increased the number of the copies to 8,000. in general within 3 years of the existing of the center it was published 40,000 copies of the prayer book. This prayer book is very popular and well know in Ukraine. Many members of Living Rosary and Brown Scapular Confraternity use them in their daily prayers. May God bless our apostolic work in the New Year 2009! I'd like to thank you for all your kindness, which benefits members of the Living Rosary here in Poland. Thank you for the Oils; a big package has arrived recently. Still, I'll be running out of them shortly, so I'll be hoping you might be able to send more. I've sent two lists of new members (#431 and 432). I've asked my son to send you a donation of $100. On December 27th we baptized my sweet granddaughter Hania, at the church of Dominican Friars in Warsaw. Numerous family members were present; the baptism was followed by a dinner at a restaurant and a reception at my son's place. We were celebrating and singing carols. 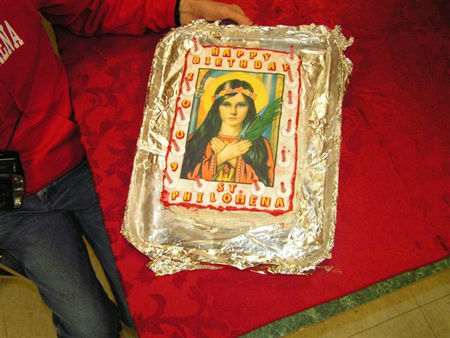 On January 10th it was the birthday of the beloved St. Philomena. With a group of members we prayed through the night at a chapel, thanking St. Philomena for her protection. 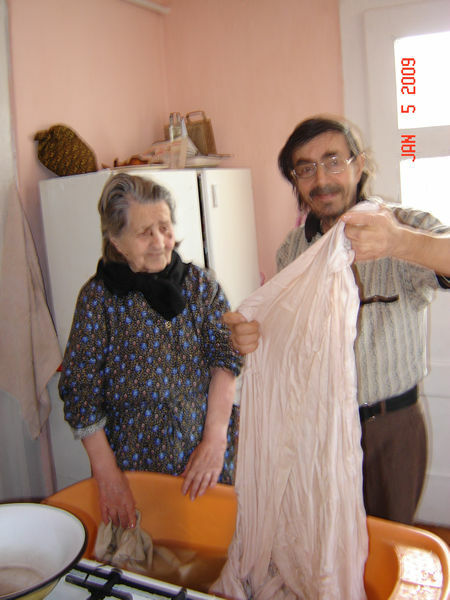 Francisc who have surgery on his intestine together with Sr. Veronica trying to wash some bed clothes. But they can not. So I helped them. Even for me was very difficult at my 65 years old. Because there is no electricity, no washing machine. For a time Francisc was the most HAPPY person from this world. He was so much impressed by this unexpected help from St. Philomena that he told me:" I am sure St. Philomena loves me! What can I do for Her?" To help spreading Her Devotion! I told him. With great joy!!!!! He answered. 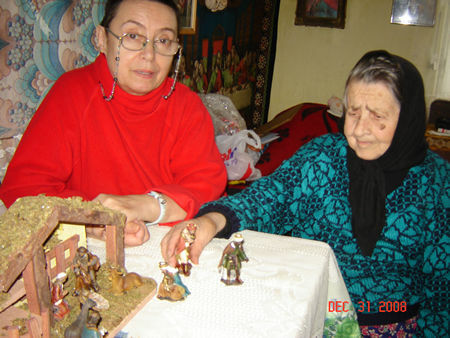 Ruth sent a Manger to Sr. Veronica. She never could see something like this before. She is very impressed. Thank you St. Philomena. Thank you Universal Living Rosary Association of Saint Philomena (ULRA)! God bless you all. Maria is my new helper in spreading the Catholic Faith. She thanks you very much for all you sent. God bless your steps! Fr. Ioan together with Br. 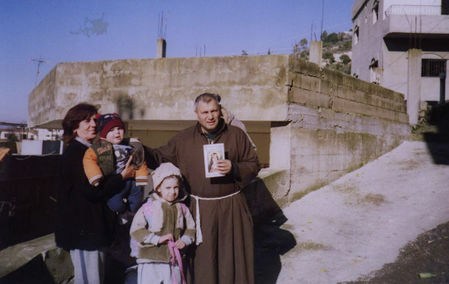 Damian (monk) in front of the Monastery "Sfanta Cruce". They send you message of thanks and fraternity together with their prayers for all you are doing for them and our Church. This is the new Monastery not finished. situated on the Hills of Mintiul Gherlii Village. Fr. 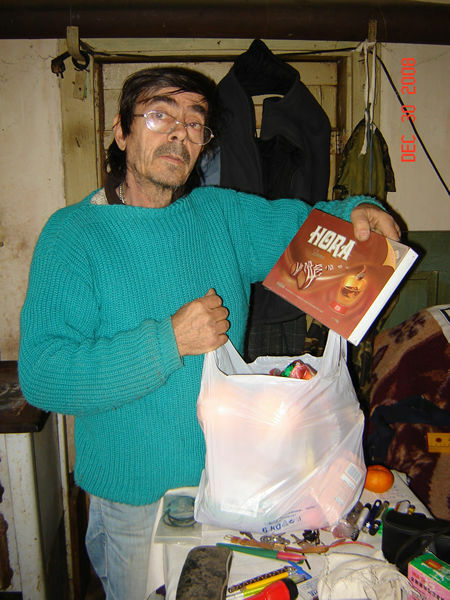 Ioan delivering ULRA materials in his Monastery. Entering in this Monastery we can see they have installed the heating radiators but they have no more money to buy the CENTRAL STATION and to finish this work having possibility to come much more people at this Church. They are sick because of the could. People no come because of the could too. It was about -20 degrease Celsius in that period. The installation is not finished but is ready to be connected at the warm station if they get a help from some organization. They need me to write at "THE CHURCH IN NEED". I will do all I can. God help me! I am so grateful for your letter I have received on the 10 of December 2008, due to unavailable communication (I was on leave for one month) on that time, I was not able to inform you on time. I thank you very much for the sacramentals box I have received on my first time from you. Here at my place in Namibia especially in my community (area) many people joined the Universal Living Rosary Association of Saint Philomena, but I have never received the Rosary numbers which I will put in their cards. By the grace of God and the Triumph of the Immaculate Heart of Mary and the Honor of Saint Philomena may you send for me the numbers and also 70 membership cards, 70 Scapulars, 70 Medals, and 70 Rosaries if it is possible and the Holy Oil and Cords. I have registered already 45 new members whose I will send soon after I received the numbers. May God bless you all and all the best. Joy of the be with you as we celebrate this New Year, in a very special I want to thank you for the package you send to us at Claretian Institute, though the package date 6 November 2008, we just got it on the 19/01/2009. We are very grateful. 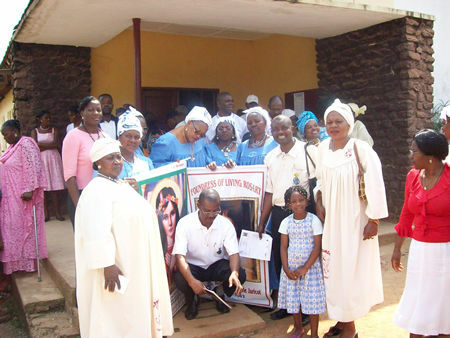 Attached here is a picture of the new Universal Living Rosary Association of Saint Philomena group I form in my home parish that is St. Thomas parish Zing in Taraba state, Nigeria. I will post some form to you through post office too. I hope you had a wonderful festive season and that this finds you well. I was browsing through the net today and I met a very interesting story today. It was all over the net. The Pope has lifted the excommunications on the Bishops of the Society of Saint Pius X. What does this mean to an ordinary Catholic? Does it mean that we can attend Latin Masses in their Chapels freely now without the fear of being excommunicated? I really need your advice on this. Meanwhile our country continues in its downward trend. People are still dying from cholera and we have no running water for a week now. Our local currency is no longer accepted for any transaction...only the South African Rand and the American Dollars are accepted in shops. Hunger, poverty, disease and death are the order of the day. Please pray for us. I am starting to send you the pictures for the newspaper. 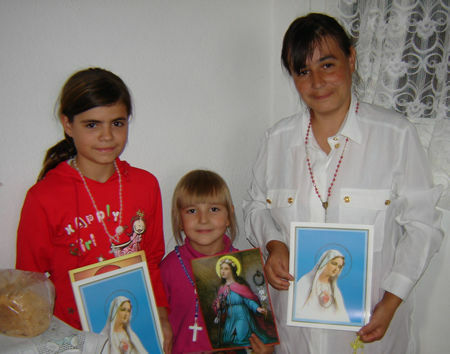 The pictures of members of Universal Living Rosary Association of Saint Philomena (ULRA) from Spain. 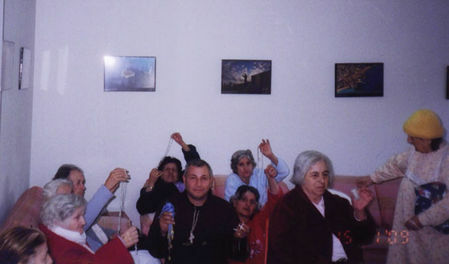 There are five new groups of Living Rosary from the city Malaha. This is very dynamic and alive community of ULRA. 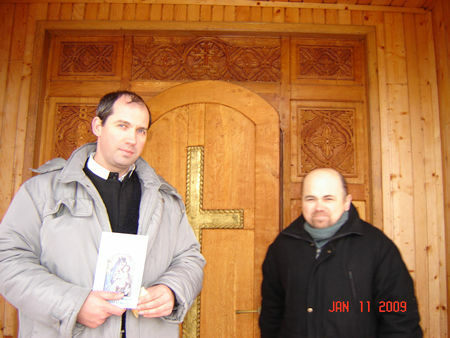 They send me the pictures of the members and now I send you the pictures of them with the prayers and respect father Ivan Kolodiy. 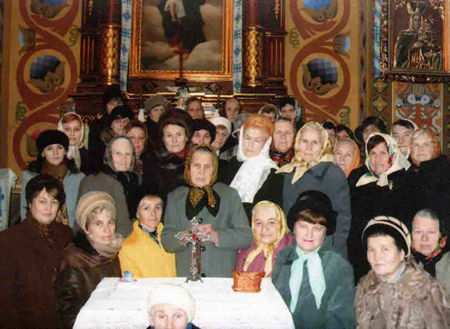 Members of Universal Living Rosary Association of Saint Philomena from village Kluchyvka. 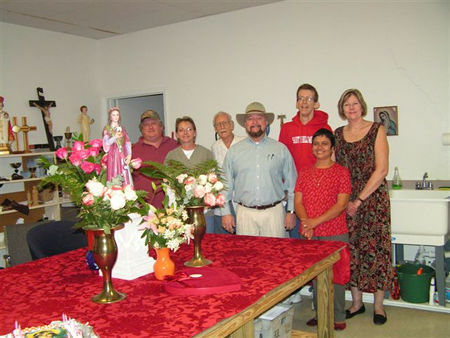 This community has a lot of new members and they spread the devotion to Living Rosary and to Saint Philomena. I would like to recommend you to put this picture in the newspaper. 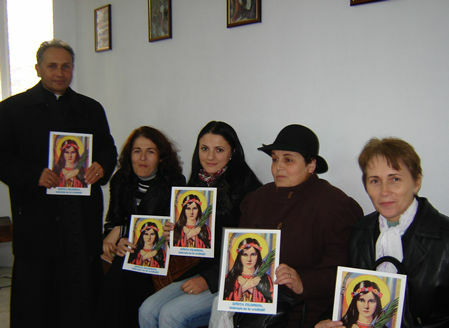 Members of Universal Living Rosary Association of Saint Philomena from village Stankova. 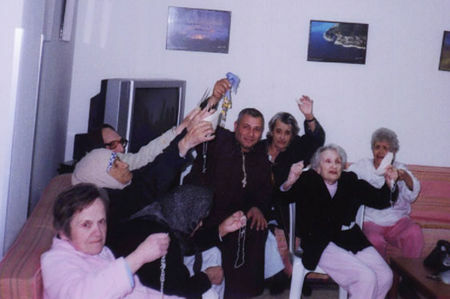 The woman who is in charge of Living Rosary is almost 90 years old. Her name is Oleksandra Gyshpel. She enrolls every month almost 50 new members of Living Rosary. 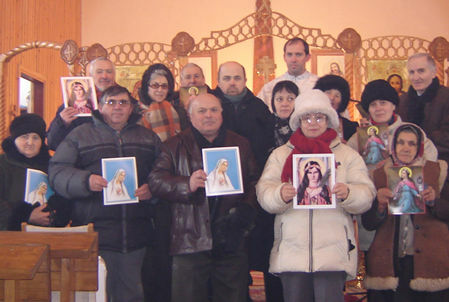 She launches the new groups of Living Rosary in the villages in Western Ukraine. This is other picture group from big village Sokal. The group of the members includes 300 members who pray the Rosary, do some charitable mission, help the parish priest with the church work. 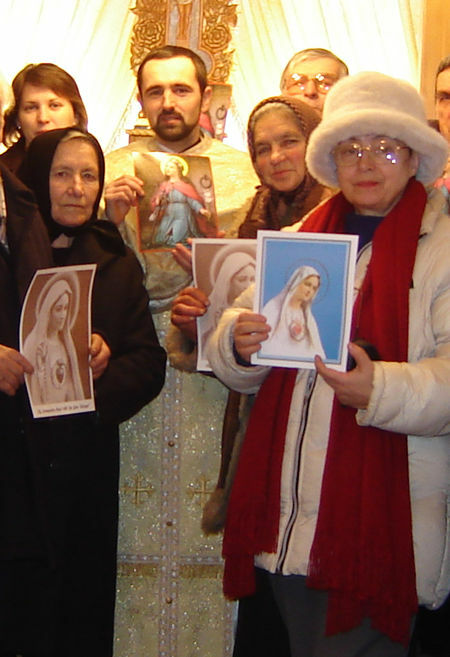 They love to read the newspapers of Living Rosary and they thank the Living Rosary for brining the devotion to Living Rosary and Saint Philomena, with the prayers and respect father Ivan Kolodiy, Ukraine. Fr. 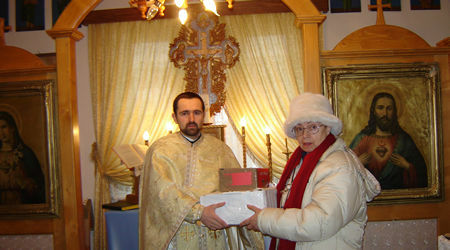 Baciu receiving Universal Living Rosary Association of Saint Philomena (ULRA) materials shipped from the Universal Missionary Center in Dickinson, Texas, United States, in front of the improvised altar at Mintiu. Fr. 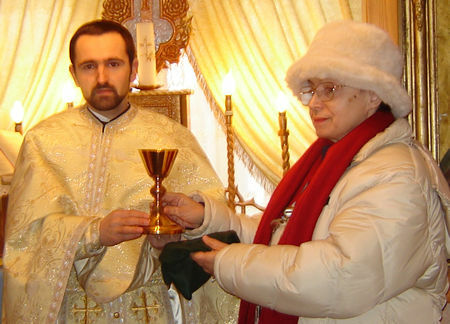 Baciu Alexandru receiving a chalice from Universal Missionary Center in Dickinson, Texas, United States. He is very much humbled by your generosity! Together with his entire Parish he prays for you and all our ULRA Family. God Bless You Dear Patti !!!!!!!!!!!!!! Fr. 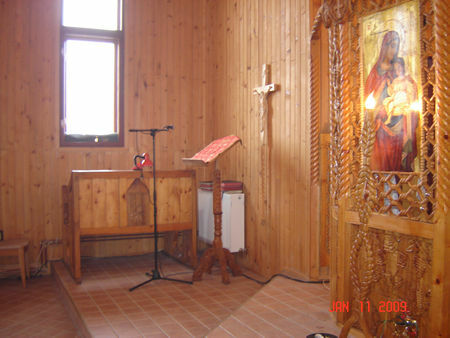 Baciu Alexandru from Mintiu into an improvised chapel, spreading the devotion of St. Philomena. Fr. 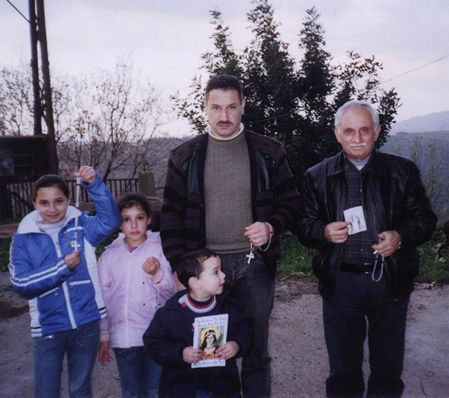 Ioan Albu from the Monastery "Sfanta Cruce" also spreading St. Philomena's devotion. He is very sick (Has flu) because there is no one source of hit to make a little warm. And the frost is round -20 degrees Celsius. The five boxes of rosaries, diamond rosaries, and pure white arrived yesterday! I am so grateful and I appreciate all your gifts to us! Inside the boxes were rosaries, medals, big photos of our lady and Saint Philomena, Saint Philomena novena booklets, other booklets, etc! Bravo!! May god continue to bless you! Up Patti! Bravo!!! Just wanted to compliment you on the beautiful music chosen 'Mother and Child' by Eric Genuis as theme music for the Universal Living Rosary Website. I purchased the CD from him. The music is perfect for the Living Rosary website. Also the website is very attractive and well set out. You might have received notification of Father E. Leslie from Pietermaritzburg, South Africa who has been killed two or three days ago. He was a member of The Living Rosary Association. I have notified the Priest who is going to assist the faithful there, of his membership. Hopefully one of the faithful will notify you and give you his number. Fr. 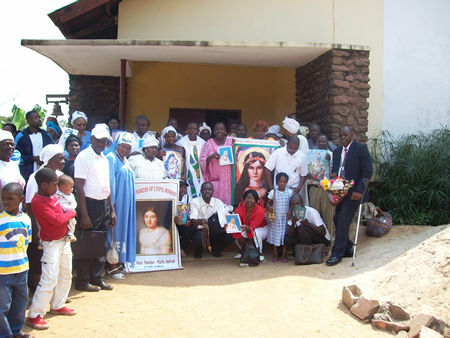 Leslie of Durban Africa was a member of the Living Rosary for over 15 years. A very saintly man. May his soul rest in peace. I have an update on Fr. Eldred Leslie (who was found murdered in his home at the Chapel of Our Lady and St. Michael in South Africa) from Jean Francois who called me again just recently. I have now before me two website links about the death of Father but I still cannot decipher from them the actual town the chapel is located in but I do know that is within the vicinity of Durban, South Africa. The Witness, a newspaper that reported the event is listed as the town of Pietermaritsburg, South Africa. Jean Francois apologizes for 1) the former mispelling of Fr. Leslie's name and 2) that he had the incorrect info that it was a stab to his heart. It was a stab to his neck. Jean Francois said to me: "we are just totally devastated. We are now without a priest. "His main concern is about the holy vessels, Eucharist etc. in the Church that the police will not allow the parishioners to remove from the premises because of the investigation. The two accounts I was able to locate on the internet about the incident are the same article with a little various information. I will reprint the article below with all of the very sad details. My first thought as I heard this news and as we have a new start in our government was this murder is symbolic of the persecution to come for all of us traditionalists. Thank you to every one for their concerns, and quick replies, prayers and Masses for Fr. Eldred Leslie and his grieving parishioners. The facts of the articles state that Fr. Leslie was found slumped over in his home. He was 83 years old and had multiple blows to the head and was stabbed in the neck. AN 83-YEAR-OLD Traditional Catholic priest of the Chapel of our Lady and St Michael in Bulwer Street was found murdered in his home which is part of the chapel premises. Police discovered the body of Father Eldred Leslie just before 7.00pm last night after being alerted by Leslie’s nephew, Kenny, who lives nearby. Kenny Leslie told The Witness yesterday he had gone to his uncle’s house to check on him as a parishioner had been unsuccessfully trying to get hold of him . "This parishioner told me that they had been trying to phone Father Leslie but could not get hold of him. As I have the keys [to the house] I went in. All seemed fine from the outside as the gates were locked, as is normally the case. However I became suspicious when I saw that his backdoor was not locked," Kenny told The Witness outside the house where police were still busy combing the murder scene for evidence. According to Kenny, his uncle always kept the doors and gates locked. "When I got inside I noticed that the doorknob on his bedroom door, which was closed, had blood all over it," he said. Realising something was wrong Kenny phoned the police without entering the bedroom. "The police responded and as they entered they found the body of Father Leslie slumped on the floor of his bedroom. He had sustained severe head wounds believed to have been caused by a sharp instrument," said police spokesman Senior Superintendent Henry Budhram. A source close to the investigation said Leslie had been stabbed in the neck behind the ear and in the head. The motive for the murder was still unknown yesterday and police said that no property had been taken from the house. Father Leslie lived alone in the house, police added. According to Kenny, this was not the first time that his uncle had fallen victim to crime since arriving in the area about ten years ago. "Since arriving here he has been robbed and had his house broken into about 15 times and that’s a conservative figure" he said. Despite all this Father Leslie continued to do good in the area.. 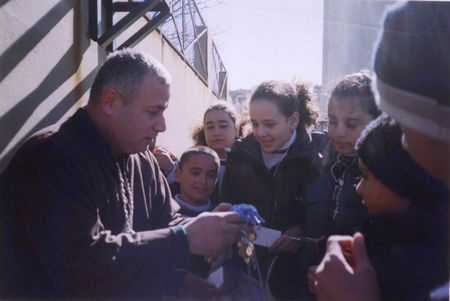 He was well known in the area especially for his work with street children and the poor. "He gave street children and destitute people food and even paid school fees for some of the children," Kenny said. Residents of Bulwer and adjacent streets, who gathered outside Father Leslie’s house, expressed anger and shock at the brutal murder of the man they described as caring. "We, the residents of this area, are living in fear. There have been a spate of crimes in this area. We can only hope the police arrest whoever is responsible for this deed," said one resident who did not want to be named. One of the parishioners, Terence Talbot, described the priest as kind and caring. "He was very committed to the Traditional Catholic Church, what has happened here is a tragedy," said Talbot. I got the box yesterday at 13.17. they brought it to me in my room, as it was very heavy. They know me well by now, as it is the same driver who comes to our place. When I am not in, he always calls Sister Claudia and insists on putting it near my door. Oh! thank you very much dear. OH! I love the two books enclosed." Conversation with Christ" is fantastic. It has a lot of teaching in it most of the questions about the meditation are clearly answered. I do not know what to say to you, and also how to thank you enough. The other book of sermons I passed to one of our very young priests this morning as he came to celebrate mass for us. He was very happy. He liked it. Thank you for everything. I like the calendar you must have worked very hard to compose it. The priests like it, as it is very handy. I carry it in my bag It saves me a lot of worry as it is always answering my questions. I posted the lists of names of all our new members in the Universal Living Rosary Association to you on Wednesday. Now I am very busy writing other names to be posted soon. I can feel that you are praying for me, as things are changing and my health is improving. I am asking you to make a special novena to St. Philomena for I am in need of money to pay the doctor. One Jesuit priest in Rome sent me 500 euros to pay the doctor, but it never arrived. It is lost. I want Saint Philomena to trace and bring it back to me. Will you kindly help me with your fervent prayers. I know that your prayers are with me always. I am getting used to getting up at 4;00 a.m. Make my meditation till 5:00 a.m. wash and then go the chapel to join other sisters for the morning prayer at 6:30 a.m.
May God bless you abundantly. I am very grateful for the pictures of Pauline Jaricot and her medals. The members love them. I also thank you for sending me Holy Oil of St. Philomena. You can not imagine the number of people who come to ask for it. They have all kinds of ailments and evil spirits. Those evil spirits are the main fear of Basotho. So that is really a big fight going on here. I dish out the Holy Oil, and I hope that satan will soon be conquered. This morning I received your beautiful parcel which I have been waiting anxiously since your notice last November. I am real greatful for your concern for my parish of OUR LADY OF FATIMA. 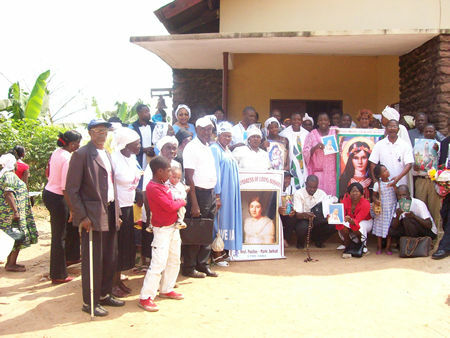 I wish to apologize for my delay in letting you know of my efforts so far concerning the establishment of the Universal Living Rosary Association of St. Philomena in my locality. It is my pleasure to inform you that, the Diocesan Bishop of my Diocese is in support of the establishment of it, He encourages me to go ahead in recruiting new members to the association. Right now the issue is in progress. My greatest worry now is how I’m going to handle such a great crowd without some necessary factors needed for it; please I solicit your support towards it both financially and otherwise. Most especially the prayer manual and other books necessary for it. The group picture will be sent to you when the registration is complete. Today(20th)we received two boxes of Rosaries, Dedicated Decades magazines, Calendars, Mother of Souls in Distress (single Sheets), the same in flyers, Pax Tecum Filumena Booklets, Cord, St. Philomena Medals. Decade Appeal Cards and Gift First Holy Communion Cross 12 Boxes and radium rosaries with mms. I am extremely thankful to you Sister for all these Sacramentals for Universal Living Rosary Association of Saint Philomena (ULRA) promotion and for sharing auring All India Promoters' Conference in February This years. I wish to thank you for the letter containing information about the Universal Living Rosary Association. This was first introduced to me by my cousin Nkengayi Ernest in Sweden. I saw my decade which begins on the 11-02-2009. Please kindly send to me the Rosary and other things that will enable accomplished my task. I am really grateful being part of this. I hope to experience some change. I am also prepared to inform my church group members for the only English mass at the Catholic Church in Linköping Sweden to join. St. Philomena the wonder worker had traveled and reached as far as Romblon, Region 4 Island of Luzon. Sis. Carmen Mortel, DD took vacation to her home province Romblon. Then she met their parish priest Rev. Fr. Nelson Mutia, Mt. Carmel Parish, Brgy Carmen San Agustin, Romblon. Sis. 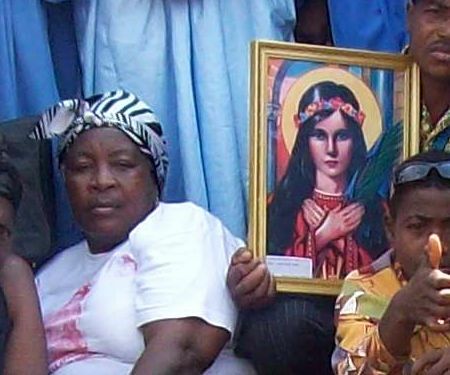 Carmen introduced the devotion of the living Rosary and a devotion of St. Philomena. He was so very interested and he liked that his parishioner will join in the devotion of the living Rosary and at the same time a devotion of St. Philomena. So he wanted to request Rosary beads, about eight (8) thousand Rosary beads. Sis Carmen Mortel told me all about it that she has to comeback in their home province to join their feast day of our Lady of Mt. Carmel. 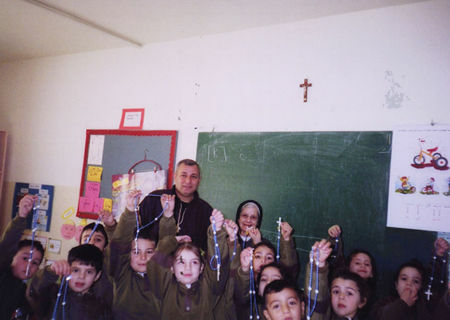 One of their activities is a recollection and giving of Rosary beads to their parishioner. Sis. Carmen Mortel has to borrow the three streamers St. Philomena, Immaculate of Mary and Ven. Pauline Jaricot. But my problem is the transportation of huge number of Rosary beads because it travels by bus then transporting again in the boat. So if possible the transportation is directly from your main office to Romblon. Their feast day of Our Lady of Mt. Carmel will be on Feb. 16, 2009. I agree with Sis Carmen Mortel, DD to submit the names of the new members of the living after their feast day. She is an honest and responsible nun. Thank you and God bless us all. I write you with heart of good mood today since our friend Joseph died when he shot by rebels! I write you on behalf of entire population that you support during war and gave us medals and all for keeping us near God! We appreciate you because we now see some fruit and light at tunnel end, with possible stop of war in East, although we need prayers to help more the situation. First time I write you not from jungle, we have some small peace. I don’t known whether you hear the news from Africa, its miraculous and propelled by you Madam Patti and benefactors because we knows that you interested in us so much in our suffering. Last week everyone in bush was amazed and we put this to Mother Mary through the Miraculous Medal which we have been wearing heavily from you! Now some peace, I told you that the rebel of Laurent Nkunda spited into two and appeared weak now. One group opposed going to Nairobi for peace talk with Government du Democratique du Congoleis officials, claim that Nkunda , the leader was authoritarian and killed many of his officers, Even the day when the rebels were be in Nairobi was surprised, the other group claimed to have ousted Nkunda! 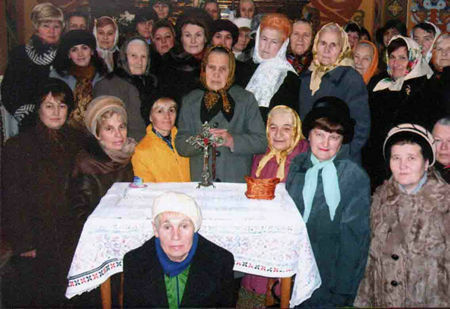 Thanks for the miracle; the new group immediately announces that they are starting to observe unconditional ceasefire! This is still up to now and same group has offered all the rebel forces to be subject to Congo government orders!!!!! Thanks mama this is a miracle affected by you and benefactors, no doubt about it, the way you all encouraged us and prayed for us, reached us with sacramental through decaying bodies and blood is the fruit that is see a light at tunnel. 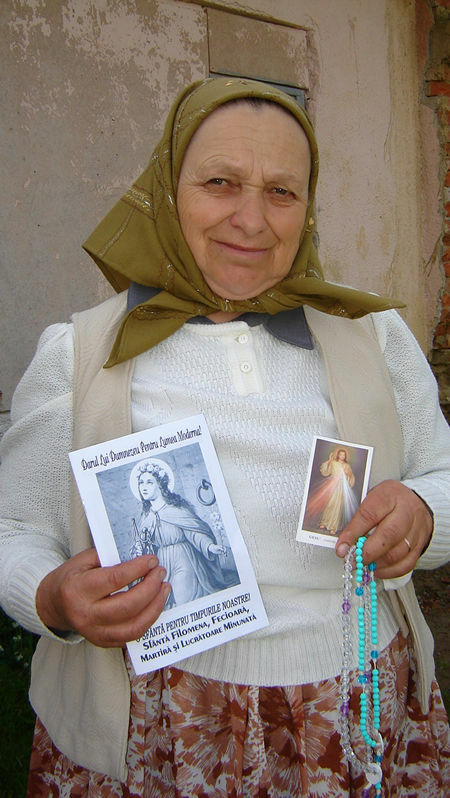 Mama, we have nothing to give you but pray for you and benefactors! We can’t express best because English still learning not so much but I tell you as we continue to pray peace, we pray for you and association. Many malnourished children and women are saying that you come to visit us when peace comes full! So that we see you. Yesterday a mother of four all with medals told me that she wanted to give benefactor and director of Universal Living Rosary Association of Saint Philomena (ULRA) a piece of gift, because she happy that war might end as Emma told us to pray and wear the Miraculous Medal. She now has all her children, has not been get medication, no food and sleep in jungle but none of her child fell sick or died!!! She thinks that you eat the food that is given to respected visitors here, the monkey! Then we told her that you don’t. Thanked very much by all, we see miracle coming slowly. Please, say our thanks to all the benefactors, we push on and pray that we get well better as we need much prayer. Remember when you told us after I told you the death of Joseph, you said "May the blood of Joseph be water to nourish the seed of peace". May you be well. We once ask you accept our thanks that your efforts to reached us are gaining good things to peace again, we thank you dear Patti and the benefactors for reach us, we know Emma doesn’t want this I was told that he wants no praise and most time he would just cry! So we will not write to thank him, seems it makes him emotional. Let us give peace him but for you we have. 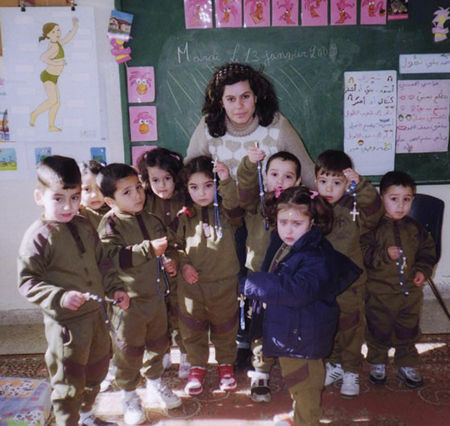 The Sisters of Charity of Mother Teresa from Gaza and Jordan have been requesting me for Rosaries and Miraculous Medals. It is impossible to send them directly to Gaza. Please, send me as many as you can and I will distribute it to them. There have been too many requests in my communities for these religious articles also. 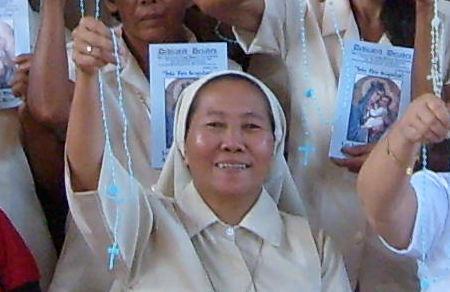 The Sisters of Mother Teresa in Gaza as well as the 13 Filipina wives in Gaza are my new heroes. They were given permission to leave for their own safety during the war but they chose to remain. The four Mother Teresa sisters chose to remain to take care of the handicapped children and the sick in their house but the two Mother Teresa sisters had to leave against their will. The two sisters from Gaza were with me at the Tomb of the Lord on January 13 while celebrating the Holy Mass for all the members of URL of St. Philomena. They were truly grateful that I gave them a dozen luminous rosaries from the Universal Living Rosary Association of St. Philomena. The Filipinas married to Palestinians wouldn't leave their children and their husbands alone in Gaza. I continue praying for you, all volunteers and all your members daily in the Holy Mass in the shrines of the Holy Land. I remembered you especially at the Grotto of the Nativity during Christmas and Three Kings. Greetings from Nigeria and I do hope that you are fine. I am Rev. Fr. 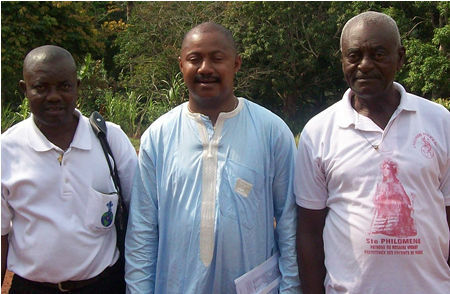 Kuha INDYER, CSSp, and a Holy Ghost Missionary Priest. I was born in 1971 and ordained a Catholic Pries in the year 2000. Since my childhood, I have had a great devotion to the Blessed Eucharist and our Mother, Mary. My desire to become a priest was answered through my devotions to Jesus in the Blessed Sacrament and the intercession of Mary, our Mother. I am also a journalist; I have just completed course work in my Masters degree. I have opened a boy’s boarding school in a rural area called 'Holy Ghost College, Sankera.' Through the help of God, I have 101 students in its third year of operation. It has been a difficult project but my heavenly mother has never disappointed me. Due to the misunderstanding people have about the Rosary, I have decided to write a book with the title 'Give me my old time Religion.' It is a reflection on The Eucharist, the Cross and the Rosary' in the life of a Christian. I have been interviewing personalities around the world to get their views. Many of our pastors are preaching Cross-less Christianity and many people seem to be running to these churches, I do believe that Christianity without the Cross is satanic worship as Jesus says, if you want to follow me, carry your cross and follow me. The Eucharist is the spiritual food that aids us on our way to heaven, while the Rosary is meditation on the life and death of Christ, my reflection in the book falls along the summary I have given above. I did contact one of my friends and sponsors in England, Yvonne Windsor, of the Latin Mass Society, to share her views for the publication, and to my delight, she sent me with literature about the Universal Living Rosary Association and St Philomena. After reading through the literature, I was more than delighted and I decided to write and enquire how I can become a member and also join others around the world. As a priest, I keep to my daily Mass with the students, who also pray the Rosary every day, roaming around the school compound in the evening. If possible, I would also like to become a member and also participate in offering Masses for the intentions of the members around the world. 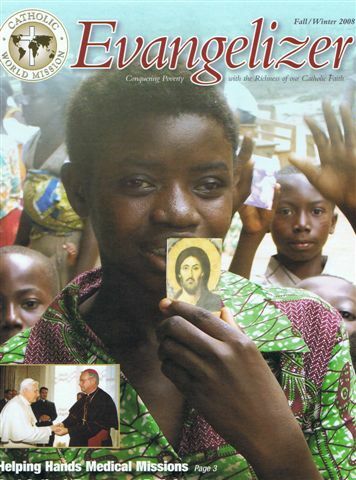 I would like to mail some publications about our school to you by post so that you can read about our humble efforts at evangelization here in this part of the world. How can I become a member? Waiting eagerly to hearing from you. I am a member and volunteer for your medal stringing. My name is Rebecca Doolin. I just wanted to let you know that I will be starting a 9 day Novena for the ULRA and for you Patti for success and personal victory with Jesus. I hope that in all the wonderful things that you do that all success is yours through Our Lady of the Rosary and our Blessed Saint Philomena. I have been using the Holy Oil of St. Philomena for quite some time especially since my Cord broke a while ago, and I just love the feelings of strength and peace I receive instantly from it. You are all beautiful and a blessing to the world!!! Dear Sister in the Lord. Greetings of love and peace from Belgium! Thank you so much for the package of holy oil and cords of Saint Philomena and Miraculous Medals which I received last month. Sincere and heartfelt thanks as well for the booklets, "Dedicated Decades." I want to tell you that I am blessed to be a part of the large Family of the Universal Living Rosary Association of Saint Philomena. I appreciate deeply the booklets that gives us the news of the Association! It is full of encouragement and spiritual strength. I am always encouraged whenever I read testimonies of miracles, healing and lots of blessings and graces people obtain through the constant intercessions of our tender and Immaculate Mother Mary and Our Wonder-Worker, St. Philomena. It is very hard for me to put in writing what I am experiencing in my spiritual life. What I can say very plainly is that my spiritual life has changed ever since I joined the Universal Living Rosary Association. Whoever has given himself or herself wholly to Our Blessed Mother by consecration or simply by wearing her Brown Scapular never remains the same again, truly. I am a Religious with a constitution and public vows but never have I experienced before the closeness and constant presence of Mother Mary in my life than when I joined the Universal Living Rosary Association! Praying the Rosary has become very sweet and enjoyable. The more I pray the Rosary the more I want to continue praying it. What a race to live in the Heart of the Immaculate Mother! Unfortunately many people here in Belgium are not Catholics and those who are Catholics do not practice anymore what they once believed. 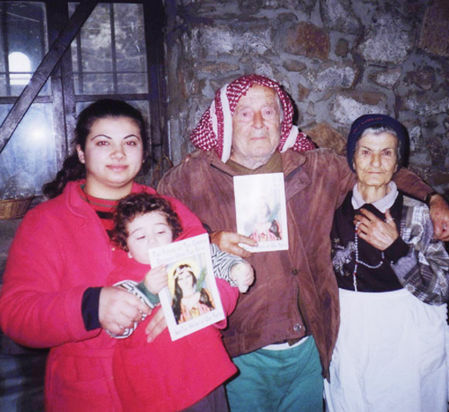 I pray much for them and I know and believe that one day Our Lady will help them come back to the Faith. 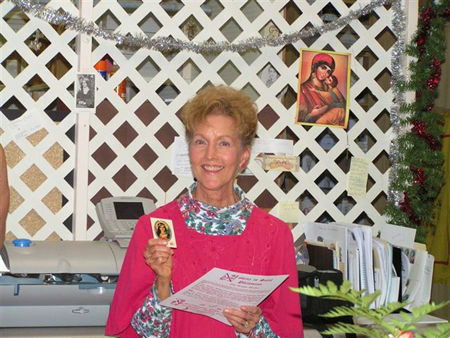 Please pray for one of our employees, Marie-Chantal. I am very sorry, I really have nothing to send to help the Association but, kindly, receive my spiritual bouquet of prayers, Rosaries and love as a sign of my deep concern and union sharing with you every joy and pain, worries and hopes, aspirations and desires, longings and success. 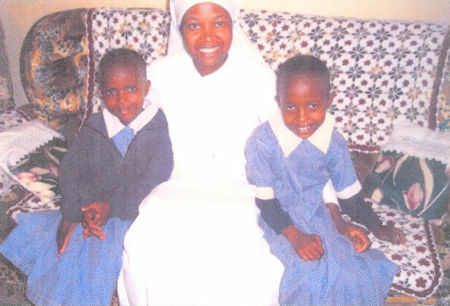 I am from Nigeria and when I visited Kenya I met Suzan and Immaculate. They are twin sisters in the orphanage where my cousin, who is also a Religious, works in that orphanage. Please pray for the orphan children. 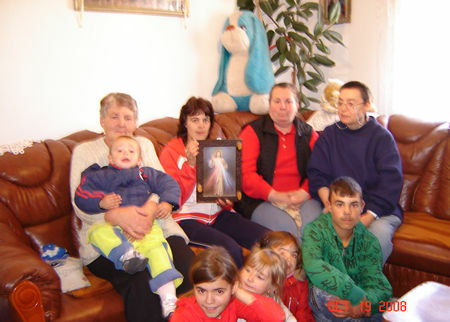 On the 22nd of December 2008, this family visited us and we had a recollection with them in our community. 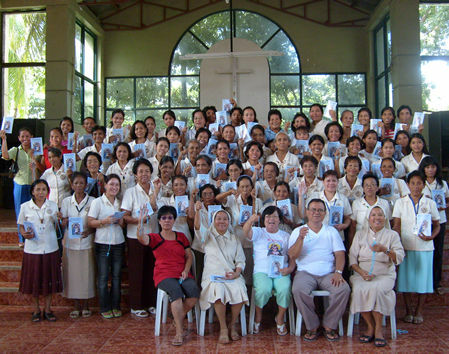 They are Universal Living Rosary Association of Saint Philomena (ULRA) members. During the recollection, we gave a talk on the scapular and the entire household was enrolled into the scapular confraternity. Find attached some pictures. Immaculate Heart of Mary, Be my salvation. I am writing from St. Bonaventure College Lusaka-Zambia (Rivortoto Friary). May God bless you for bringing His souls to Him through our Mother Mary, especially for those who have given their lives to St. Philomena. I have been a member of living Rosary for about ten years now; I real acknowledge the presence of our Mother Mary in my life, in my religious life and pastoral life. Thank You for your work. I am asking if you can send me the Rosary of St. Philomena, the small one of 13beads. 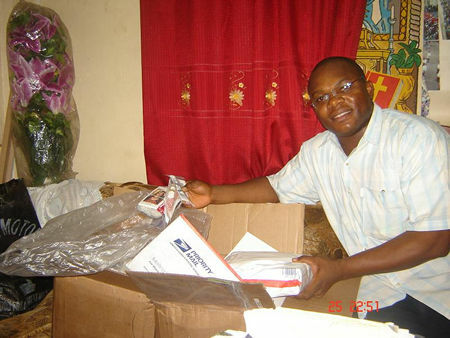 Thank You for the articles that I receive through the coordinator here in Zambia - Mr. Gabriel. Some of these articles I shared with my members in Tanzania when I went for my holiday. May our Dear Mother strengthen you always! 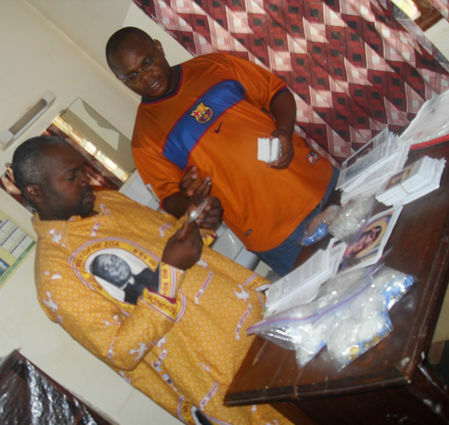 Many thanks for the Rosaries you sent to me. Please be assured that they have been given to the people of whom the request was made. Thanks for putting me on your permanent mailing list. I personally very much trust the power of our Mother of the Church in our lives, it is for this reason that I wish to be in love with Her and Her Son our Lord. 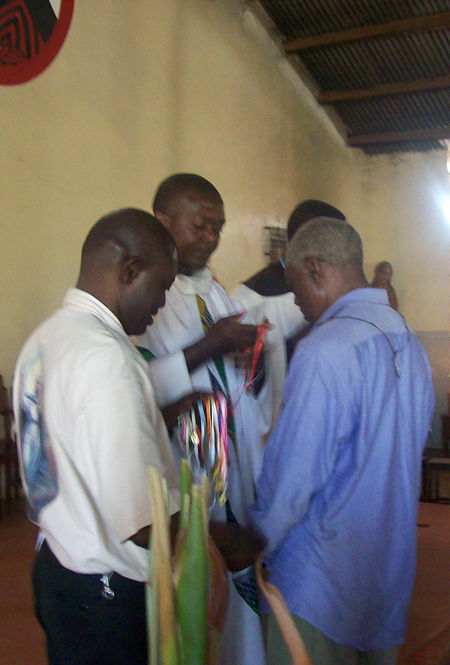 Please note that they are still many people who wish to have the Rosaries, the numbers grow each time I go for pastoral work. If you could consider these people so much the better, they all appreciate greatly. Be assured of my prayers all the time. May God Bless all the generous benefactors and all people of good will. I am humbly looking forward to hearing from you. Greetings from YaoundÉ. I posted to you some registration forms and an annual report of our activities for the year 2008 well interspaced with pictures. Hope you will find them interesting. I am equally attaching some pictures. You will find me with Rev. Fr. 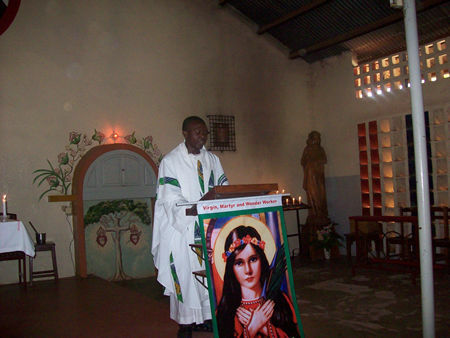 Alexandre MVOGO, cmf; A ClarÉtain missionary working in Akono, here in the Archdiocese of YaoundÉ. He is currently registering many people. Thank you I received your message with this monthly support money. In this cause I am only helper to my parent with my mother we are eight families. Try to think that and tell me something. Now I am sending the photographs those who I help them a little. I write their back ground in shortly. Now I send nine poor Christian from our member. The left three I will send next week. And there is with members in front. You will see in what way I am distributing which you sent me. I want to send many photographs but I haven’t digital camera I use this scanner taking from my parish priest. She is old. Her group has died and now she live with a helper. Her son has about family with her. Now living cost be come to heavy. In this case except shelter & feeding she didn’t have cloth night cloth to build her ability there is no anything she is a poorest of poor. He is sick and doesn’t work because he is so weak. He don’t have supporter and he was living by praying and asking the church follower support. She is alone and she has many family her has group was strong Christian but now he is unlived. She cares her children by poorness. She was crazy before. Now with a help of God and a praying of our member of the Universal Living Rosary Association of St. Philomena praying she come full fine. 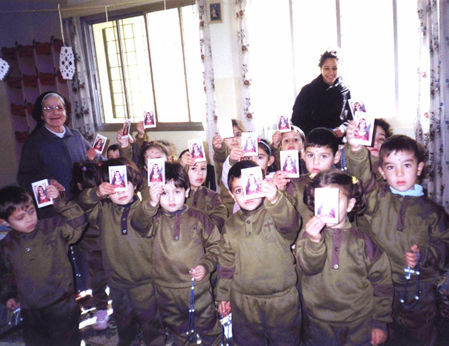 We were praying by going to her house by caring ST. Philomena oil & scapular. In this process I was ahead of this group. I paint St. Philomena oil in her for head & I wear to her blue scapular & we pray in many time rosaries by asking marry to help her. After many our praying now she is fine & she be the follow of St. Philomena she be the example of for our member. He is now living with the help of some strong Christian. He has three children with his has group they are four. He hasn’t ability to digging so now he is living by sacrifice. Mum, many letters for seminars and demand for rosaries as you can see from the letters! 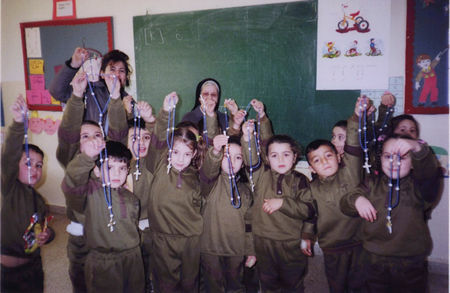 We need more rosaries for Universal Living Rosary Association of Saint Philomena who are dedicated to their decade 2009 action! Greetings. I hope the Death anniversary of the Venerable Pauline Mary Jaricot was done well, us here we had a day of Fasting and prayer for her canonization. Please, people out here are in need of material support and they have thirsty hearts for the word of the Lord. I reached in a village where by a priest visits the centre for mass once in three months. I cried, why? This was because they welcomed me and demanded a prayer service of which I did for them. They denied me not to leave the place until the following day. 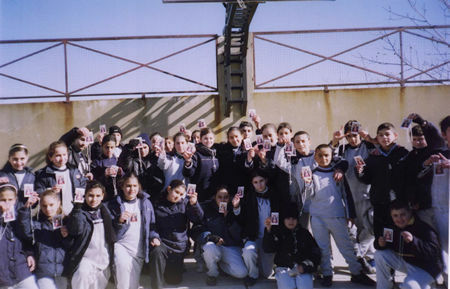 I anointed them with the Holy oil of Saint Philomena. In the morning all was, I had a nice sleep....I had a good night....I enjoyed the prayers....I am strong to work. This is because they had been fighting with the people who wanted to grab their land. And so they have no even a catechist in the community. I am praying that, I may one day go up their and be their for six months. If this can bring back the hearts of our people to God, I think it can please, you too, as an apostle of Christ. Let us discuss this later. I might send you a Fax for their needs and my story about the Journey. I got some pictures for it. 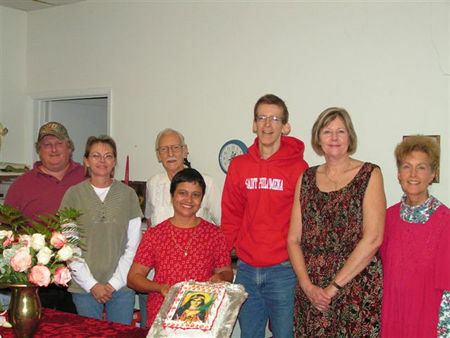 Happy Birthday Saint Philomena Office Party at the Universal Living Rosary Association Headquarters in Dickinson, Texas, Monday, January 12, 2009. Bravo mum! I will be sending you about 5,000 new members names next Monday! I am working on them! I have started seriously ULRA mission this New Year! Many demands! Next Saturday I will be in St. Benedict parish for seminar on leadership, I will say mass and talk to them and enroll them, I got the letter of invitation from the new parish priest now, and I will go with my car! 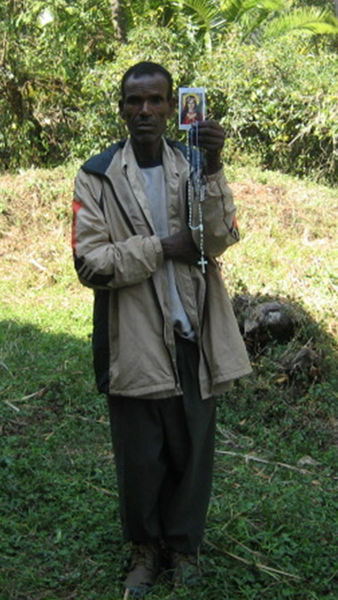 A priest asked me for 1,000 rosaries from john Bosco, and a promoter from Eldoret called Ruth enrolled 1,000 but no rosaries yet!! So mum I need about 5,000 rosaries to start the year in a big way! This year is the year of Rosary and decade and action for me!! Bravo!! Forward ever backward never!!! Happy new year again!! A year of grace for you!! This gives the privilege to thank you for my pack. I have a left ear severe pains sin 1996. And my right shoulder dislocated since 2006. All these years I was with the pains. But when I renew my members last year 2008 and started January 4 2009, my mediation on the decade Crucifixion, now I am feeling well and I believe continuing my decade more miracles will come my way. Attached is the list of my Catholic members in my Parish of Alotau Catholic Diocese of Alotau. Yes, I will see as soon as my other members receive their pack and form the association and plan to do something to assist. In the meantime I am only offering Mass on Sundays for your organization. I pray that St. Philomena, Venerable Pauline Marie Jaricot and St. Therese of the Child Jesus and Our Blessed Mother shower you with abundance grace in your care and work. May the Father and the Son and of the Holy Spirit bless you and your staff. I remain your in His Service! From November up to now I have been taking care of a monastery of trapestine sisters as a chaplain. There was no possibility of communication with you because it is a far a way place. The experience was beautiful. Silence, prayer, penance. I confess that it was a little difficult for me in the beginning but it was a grace for me. A real grace of conversion. During that time two of May relatives died. One was a religious sister. She is interceding for us in heaven. This coming week I will go back to my usual place of apostolate. I will keep in contact with you and I hope to have new members for Universal Living Rosary Association of Saint Philomena (ULRA). Today, I met Rev. Fr. 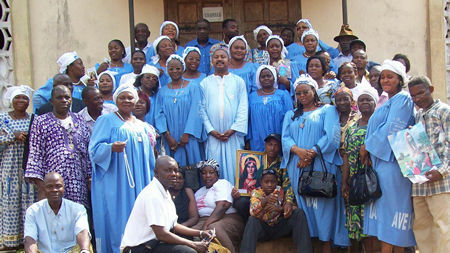 Basil Roger Mendunga, the spiritual adviser that was appointed by the Archbishop of Yaounde to the Living Rosary Association of Saint Philomena (ULRA). I went with about a hundred members. 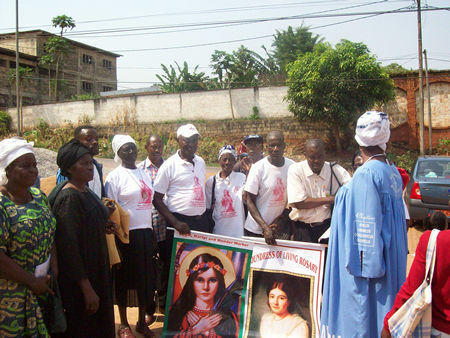 It was an occasion for us to present the Living Rosary and its objectives to the Parishioners. Following the explanation during the Mass that took place at 10:00 a.m., at St. Peter Parish, Nkolmenga, about 30 KM from our Missionary Center, about 30 new members registered immediately. After the Mass, father Basil Roger took us to his Parish hall where he again spoke to all the members. 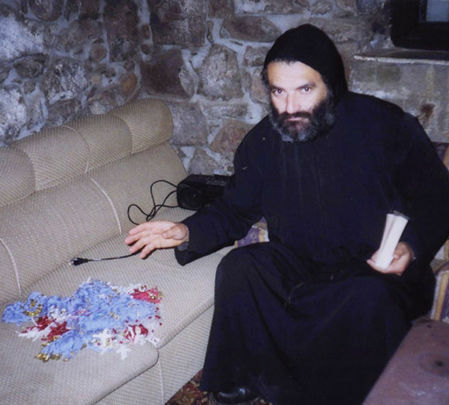 He said he knew the Living Rosary in 2006, when Paul (that is I) came to launch the ULRA at St. Therese's Parish Melen-Baab, about 50 KM from our Missionary Center, where he served as assistant Parish Priest. He continued by saying that what inspired him about the ULRA is that at that time when Paul and members of the association presented a Chalice and Patern to the Parish Priest. Knowing that the Parish needed such help and assisting the Parish with such gift was a remarkable thing in his life. In conclusion, he said he will help us in anywhere and at any time that the association may need him regarding retreats and seminars. And that since the Archbishop himself has found him worthy of the ULRA; he will do his best to spread the association within and outside his Parish. He is at his 30’s. At the end of the reception which the Parish organized for us, I presented him with a framed picture of St. Philomena, Chaplet of St. Philomena, Novena and other leaflets both in French language. The occasion lasted five and half hours. Below are some photos taken there though he was not wearing his vest. Hope Richard Fox will help to open the photos. I will be sending some lists and photos via post this coming week. We greet you New Year of 2009. We live near Darfur and send you warm wishes for this New Year, 2009. We send you many thanks for receiving our prayers and all the help you and your donors offered us. We heard that Emma is now Rumbeck and will soon here be! We pray and thank you for sending all the devotional items, and we send our love and prayers to all our benefactors. I ask that you and all your members around the world offer us many prayers for the many who now suffer so terribly in Africa. I often think that with the terrible suffering that we cannot be cast into hell because we live such hell in this life. 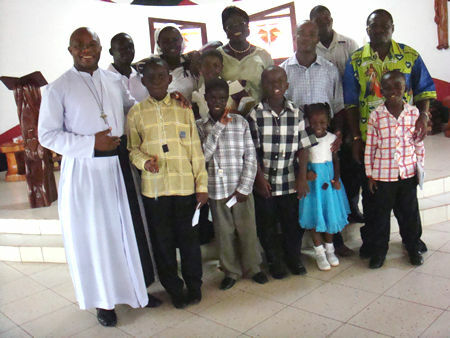 When you remember us, please pray for good health and we pray for good health for Emma and all your benefactors for their help, support and prayers for all who now suffer in Africa. We suffer more now and need Our Mother Mary to console us especially because food is so rare and so expensive. Thanks for the two boxes that you send to me. I have received them and I found a nice bag that will help me and Sister Bibiana to carry the sacramentals to the sick in hospitals and villages. Thanks too for the stole, it looks nice. I have received the cards and the red rosaries that are nice to the legions and the group of the Catholic Women Association of Kenya (CWAK). I have traveled around the Mt. Elgon areas. I took some pictures but am not in the pictures for the areas are remote and nobody knows how to operate the camera (I hired the camera for Ksh. 2,000.00 for one day). People are in fear of a stranger following the internal conflict that has left many death and many internally displaced people (IDPs). Pray for these brothers and sisters of ours who are still a live. I would like to remind you that you, wrote to me telling me that you had enclosed some Euro in the box I know not which box particularly. This will help me to mail to you the 255 new member to the Universal Living Rosary Association of Saint Philomena (ULRA) names that I have touched in Dec/Jan season. I thank you again for the nice encouraging and directing letters that you do send me. We are praying for you too. Oh! Happy New Year thanks so much for serving us we pray for you and the benefactors at each of the minute. I have been in my parish of Omaci where I come from!!!! Oh what a gift we had for Emma to be with us through the week of Epiphany, how people want to retain him so that he could visit us more, many of these people were crying and saying that we have lost our years in running into Congo and etc, so we lost the important part of our live in God! By losing to know anything about Mother Mary. Do you know and can imagine that Emma spent with us on the 4h of January, talking about St. Philomena and Mother Mary for 8hrs non stop, the heat was as tense as we took water to quench our selves, he stood steadfast. Eventually, due to his talk then we have just got up with a list of 700 souls, just from our parish only, people who are swearing to recite our individual decade everyday. He promised us to come back when he finishes with the other places he is going to have one other talk before he will go to Uganda. This was his first time in the parish of St. Augustine and many heard about Mary for the first time, people are wed with the Fatima message and promised to change their lives. There is a family of a drunkard husband and wife; they instantly left the habit after the delivery of talk. Oh your man has wide range of social life things to share as he incarnates it into the Rosary decade everyday. We are praying for him, today he boarded and left for a three hrs flight to Rumbeck where people have been calling for him, . He told us to tell you that he went because the re is no internet in Rumbeck and all this time here also net has been interrupted on and off, since start of the year. I don’t know whether this message comes out to you, if so, then inform us. Thank you for the Christmas gift you sent us, we appreciated, especially for us who have been with Emma for all this season! We pray for you and him, in the evening he will. I thank you for your letter with the stipend of Dec. 26. I always feel so inspired by your letter and the other letters/articles written in the pamphlet. "IT TAKES MANY WEAPONS TO FIGHT A WAR, ONLY ONE WEAPON TO STOP THE WAR, THE Rosary." It will be theme of my homily during these times of war in Israel, Gaza and Lebanon. Needless, to say, there is presently so much uneasy tension all around. It is too quiet all around yet it is not peaceful. I could feel the depression and frustration in everybody's face. Many pilgrims are just too scared to go around, the vendors along the streets are angry, the pilgrims' guides are deeply depressed. We can only pray unceasingly for peace and justice. Thank you for the Universal Living Rosary of St. Philomena. There are millions who still pray the Rosary. Be assured of my daily prayers in the Holy Mass for your employees, workers, all the members, living and deceased, the sick and the suffering. I remembered you especially all during the Holy Midnight Mass with the new Latin Patriarch in Bethlehem and on Three Kings Day. Greetings of peace and love to you from Balaka, Malawi in the worthy name of our Lord Jesus Christ! 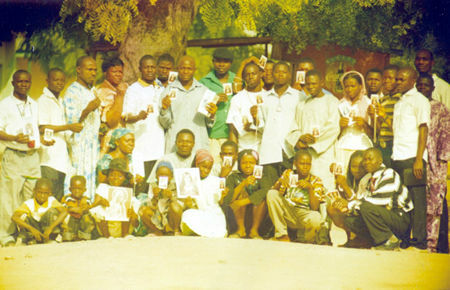 Thank you for your kind donation of the Devotional Items dated October the 22nd, 2008. We are deeply grateful for all that you make possible for our members. With firm faith and hope it’s my prayer that as we start this New Year, we go forward. We had my son anointed with the Saint Philomena Holy Oil you sent us, and he has the Cord with him at all times. And we are seeing some improvement with his dire condition. Today they removed the trachea from his neck, and he was moved in a wheelchair to the outside of the hospital for an outing in the sun. In the mail today I am sending a check to cover the 3 pkgs. of Oil and Cord, the Agnus Dei symbol, and handouts you sent me a couple of months ago, and a new order sheet with some new requests. I truly love the"My Lord and My All" tri-fold, and hope to receive some more for sharing with others. Always in Jesus, Mary, St. Filomena, Blessed Pauline Jaricot, and you Patti, for your valuable work you do. If there's a person whom I should not forget to greet this season of Christmas she should be you. And so allow me to express my apology of not greeting you ahead but I know its not yet late so here I am 'Wishing a grace filled Christmas and a Joyous New Year' and even if we had no communication since I sent you the list of my recruits (new members in the Universal Living Rosary Association of Saint Philomena-ULRA), you are always remembered in my prayers. 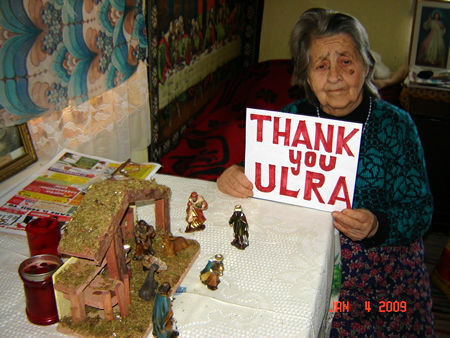 I am glad to inform you again and again that being a member of the ULRA is a fulfilling experience in one's life. I happen to be the Prioress of the two members (Sister Rosa Bañez and Sister Florida Bustillo) of the ULRA and thankful that I am a member too. 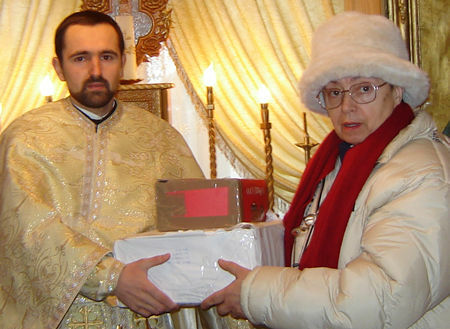 In December 10, 2008 I received your FOREX box for Sister Florida Bustillo, because she was not feeling well then but she said she will just open it when she gets well. Last December 11, 2008 I brought Sister to the nearby hospital due to her incapability to stand and weakening. She stayed there for three days and was diagnosed of "brain tumor". Our Provincial Prioress asked me to transfer her in a bigger and nearby Hospital to our Provincial (Central) House in Manila and was operated of Craniotomy last December 16. She is still recovering until now in the hospital. And with the aid of the good doctors she brings joyful face in spite of the pain of her ailment although she is most of the time is suffering from memory gap. Together with my sisters in the community, we shower heaven for God's mercy and healing power and with the help of St. Philomena that she may recover to her normal being. May I also ask prayers from you and our members in the ULRA. Up to this day, the FOREX box is still closed but having this situation of Sister Flor, may I ask your permission that I will open it so that the purpose of sharing these articles not be defeated? Thank you and May the blessing of the newborn King Jesus Christ, through the intercession of our Lady (BVM) and St. Philomena be upon you and the whole ULRA. Thanks so much for he wonderful luminous rosaries, scapulars etc. they were safely received. Wishing you a wonderful New Year, may God continue blessing you in all you do. 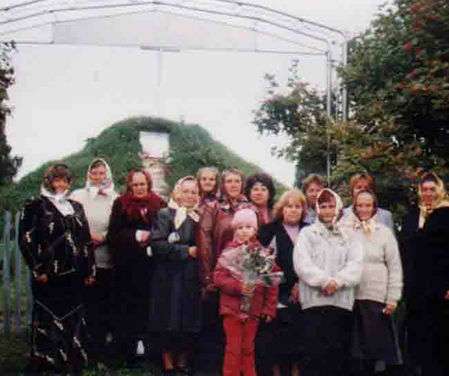 Please visit our Ukrainian version of web site at http://www.livingRosary.org.ua this is the final version of the website. All the technical mistakes are solved and now you can browse them without any problems. Thanks for your mail. Yes, I am taking some medicine but not in routine. Because when I went to Karachi I fell ill there. I got some medicine. When I went to Sargodha once again I was taken to Doctor. Then as I reached Jhelum early in the morning, my condition was again worst. I was taken to Hospital. Each time doctor got E.C.G and gave medicine. I have been advised some more tests like E.T.T., Echocardiography etc. I surely need an airlift. I especially need St. Philomena's Cords, Chaplets, Calendars, Oil and some pictures of St. Philomena (Card print). If possible please send some shirts also; I want to give one each to our promoters who will participate in the Rosary Conference next month. Hope you had a blessed Christmas and are ready for 2009! I wanted to let you know that we initiated our newest order to print prayer cards, and were able to include all 13 subjects that you requested. They will hopefully ship out by the end of the month. Just FYI, we also have 42 new cards coming out this month. I've got about half of them uploaded and on our website if you'd like to see them. We've got some classics, some originals, some bilinguals, and some less familiar saints and blesseds as well. All of the new cards are marked *NEW* in the description. Our cards were recently featured on the front of a Catholic mission magazine, and the response has been great to that. I've attached a copy for you to see also. May love and peace of our Lord Jesus Christ be with you, I am fine and keeping well. Life here in Israel is not good for so many souls; people are dying each day by war. We have some Catholic members in Gaza, they are suffering lot. Please pray for the people of Israel, both Jews and Palestinian. God loves all people; this is the land where Christ lived. Pray for the people who live in Gaza, that there would be peace and the peace of Christ in their hearts and lives. Finally, we have seventy-five new Universal Living Rosary Association of Saint Philomena members if you can try to send us Rosary and Scapular; I will send you their list soon. Union with Mary our Mother. Bravo! Three Forex boxes received last Dec. 31, 2008. What a huge gift we received on this Christmas season. We right away turnover these two tabernacles and various vestments to our Episcopal vicar "Monsignor Jose Wilson Mendoza" together with our St. Philomena chaplain Rev. Fr. Johnny Lagdamen just this morning Jan. 5, 2008. They expresses there heartfelt thanks and gratitude to the donors, and the benefactors of these valuable things, which surely they could not afford. All they could say are their fervent prayers and thanksgiving masses they could ever offer to all of you there and most specially to the director of the living Rosary your Honorable Patti Melvin. 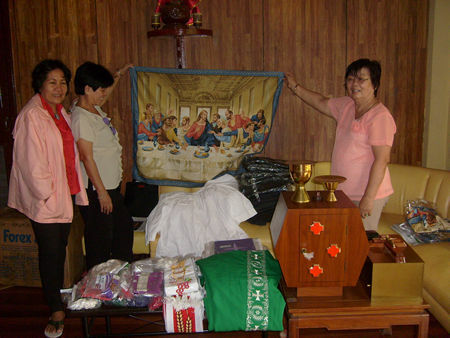 Two tabernacles and various vestments were received by them. 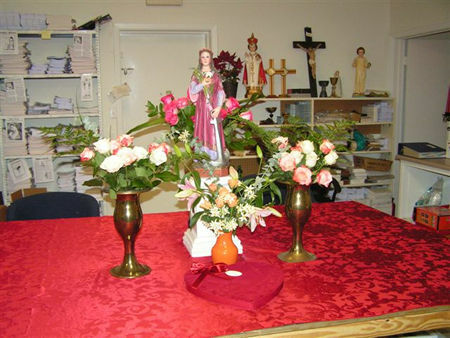 As soon as they will have their clergy meeting by the second week of January,2009, they will shared these vestments and they plan to give these two tabernacles to parishes without these things and other various vestments. May Our Lady of the Holy Rosary and St. Philomena, Patroness of the Living Rosary and the Princess of Paradise shower to us more graces and more abundance of good health that we can continue our apostolate work and reaches out our mission to every corner of the world. Thank you for your prayers for us here in the Holy Land. It is peaceful here in Jerusalem but we could feel the tension and the uneasiness of the Palestinians and the Israelis. I feel sorry for the Gazan’s who have been trapped by their Hamas leaders. They have nowhere to go. 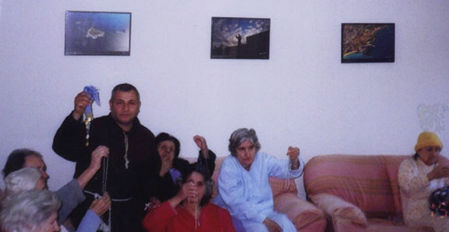 There are some 150 Roman Catholic families in Gaza. 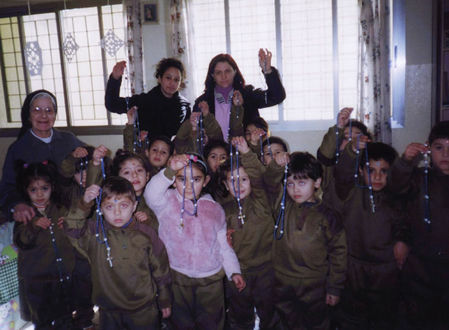 A few years ago, their school and church were destroyed by the Hamas. One 16 year old Roman Catholic teenager, Christine, just died of shock when a bomb hit a neighboring house. The Apostolic Delegate of Jerusalem and Papal Nuncio in Israel, (two titles but one person) Msgr. A. F., and our entourage were not allowed to go to Gaza last November and December. I don't want to comment on politics. We would appreciate if you could continue praying for peace and justice in the Holy Land. I am sorry, I could not write you earlier. It was because I went to Karachi; I returned from there on 22nd. Then I got busy in Christmas preparations. I prepared a crib in the chapel. After Christmas Apostolic Nunciature in Pakistan Rt. Rev. Adolfo Tito Yllana came to Sargodha. I went to see him. On 1st of January (in the evening) I went to Jhelum and returned from there last night. I therefore was very busy. I sent you some lists before Christmas and then some copies of newsletters. It was printed late due to certain factors; I got ill many times having hypertension, then there is a deficiency of electricity, my laptop was also and still is out of order and I had to do the work again, I was busy in my tours also. Our electricity problem disturbs us a lot; one cannot say when they will put off or then put on the electricity, we were getting electricity for about 4 hours in 24 hours. But now I am preparing the newsletter for Jan-March 2009 and trying to once again make the routine smooth. So, I will get it printed within this month. We have arranged our 3rd annual Rosary Conference at Sukkur from 19-21st of February. Invitations have been sent to all the promoters and some priests. Please pray for the conference. On the behalf of the members and promoters of the living Rosary, I wish you and all the staff of Universal Living Rosary Association of Saint Philomena (ULRA) a very happy New Year. 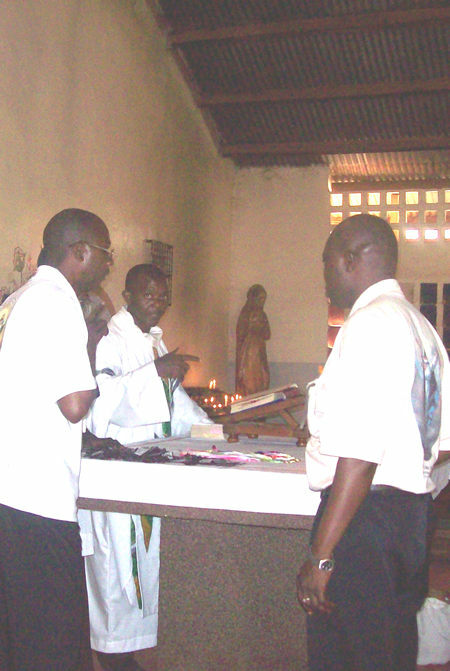 Here are some photos (see below) taken today at a Mass celebrated by a Carmelite father, Rev. Fr. Leger Marie. Below is Fr. Leger Marie's testimony made on January 1, 2009, at the occasion of Mary, Mother of God. 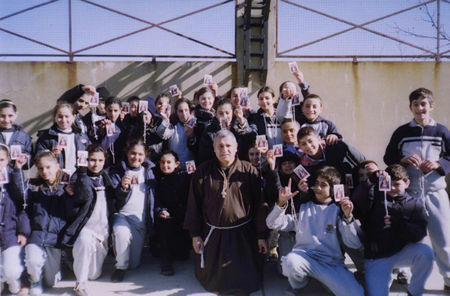 The Carmelite Father, Rev. Fr. 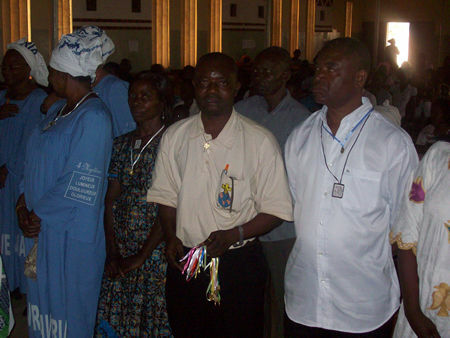 Leger Marie told us that he was saved by the Scapular from a very serious accident after celebrating a Mass with a Bishop of Ndume-Abong Bang in the East Region of Cameroon last December 12,2008. He said he was in comma for 3 days. He continued by saying that there was no doubt in his mind that it was Our Lady of Mount Carmel that had saved him from such accident. He went on to say that Our Lady is very much nearer to any of her child wearing the Scapular. All she needs from us the Fr. continued is to live a chaste life. 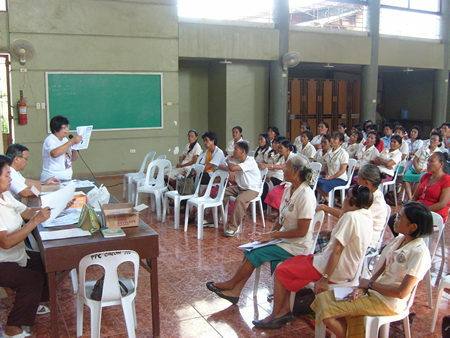 Training and formation for those to be invested with the Scapular shall begin in February, 2009. 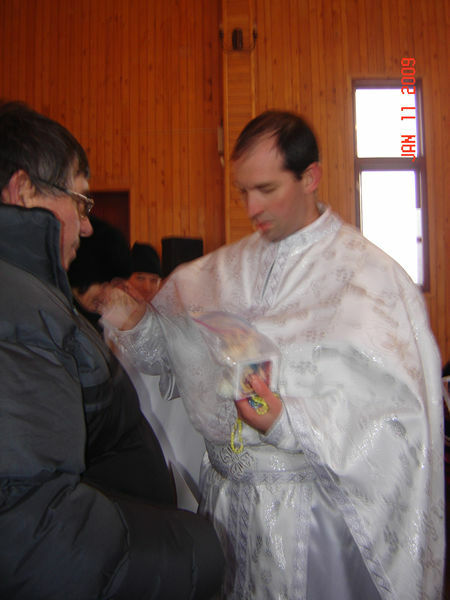 During the celebration, twenty new members were invested with the Scapular. I shall send lists and some photos via the post. 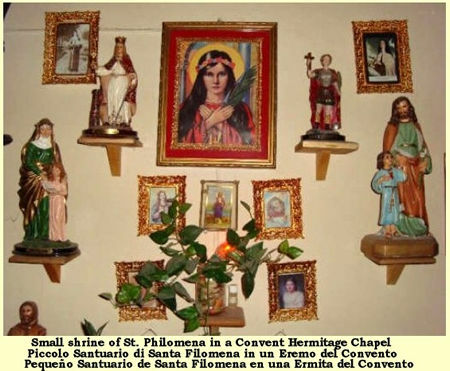 In 2006, I wrote a letter to Saint Philomena, and she obtained my congestive heart failure healing a month later. In 2007, I gave her relic almost two dozen kisses in gratitude and affection, and she immediately changed my chaplet to golden. In 2008, I was thinking of her earthly life and the paucity of evidence associated with it, suggesting since she knows where it all lays, that she should show us where it is, and 3 months later that 3rd century Greek letter marble inscription with her name on it is spotted on a church wall in Rome while my sister is standing present. 2009 - Recently I had been wondering what special thing she was planning for me in the coming year. I even mentioned my thoughts aloud to my sister on Tuesday. Later that same evening, I was at my parish Christmas party, and this deacon (in training to become a priest-- the very same one who had been traveling around the country with his exhibit of a who's who of the saints' relics) comes up and asks me right out if I would be interested in playing host in my home for a week or two to the first-class relic of St. Philomena that he has in his collection. He says it may take him a week or two first to unpack his boxes at our church’s priory before he will get her to me. I asked him if, with his connections, it would be possible for him to obtain another first class relic of St. Philomena (a bit of her bone) for me personally, and he responded very enthusiastically to the idea. So, it seems that this year St. Philomena is coming to stay with me for a while, if not come live with me in a very special way in my very own home, if that's her plan (I might have to start keeping better house). 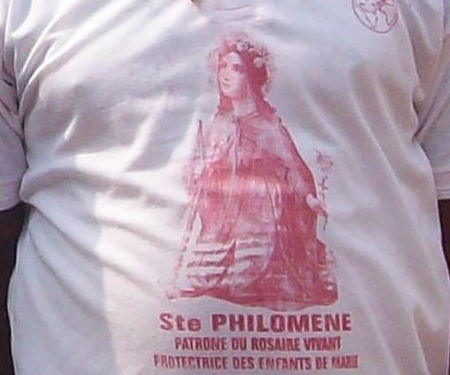 If Saint Philomena is trying to keep me close for life, she's doing a most excellent job of it.